Unified communications (UC) is a powerful technology with a multifaceted value proposition. UC can significantly reduce the cost of communications but more importantly raises productivity by streamlining the collaboration process. UC also enables coworkers to collaborate in real time across the extended enterprise (Exhibit 1) including partners, customers, suppliers and other critical constituents. UC brings communications and collaboration tools together under a common interface and removes much of the human latency associated with the process of switching between applications and devices. UC also means companies can build communications-enabled applications — applications with communications functions integrated into them — a key to sustainable competitive advantage. 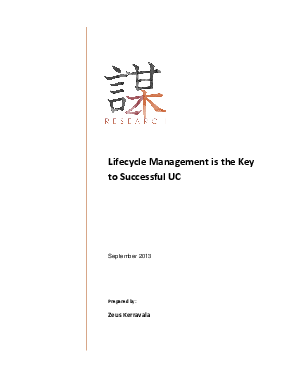 Download now to read how UC can increase your company productivity.